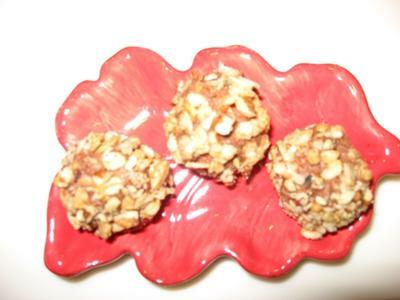 I wanted to create a fun easy truffle recipe that children could make. Using cream cheese was easier than heavy cream and cinnamon made them yummy. If you don't like nuts- leave them out! Place the room temperature cream cheese into the bowl of a mixer and beat on low until smooth. Add the confectioner’s sugar and mix in for 2-3 minutes. To this add the cinnamon. Mix in to blend. Next add the melted chocolate and mix on low for 2 minutes , scraping down bowl with a spatula halfway through. Place the mix into a small bowl and cover with plastic wrap. Place in refrigerator for an hour. Take the brown sugar, pecans and cinnamon and place in a small mixing bowl. Remove the chocolate truffle base from the refrigerator and use a melon ball utensil or small ice cream scoop and make 1 inch chocolate balls. Place each on a wax paper covered tray. When they are all formed dip each into the melted chocolate using a plastic fork with only the 2 outer teeth left so it can dip easily. Then roll each truffle ball in the nut mixture. The mixture will adhere best when the outer chocolate is slightly tacky. Place the rolled truffles in individual paper candy cups to serve. Note: melting chocolate is easy in the microwave. Place chocolate in a microwavable bowl and heat 30 seconds at a time, stir with a spoon and heat again until melted and smooth. Great job, well done on your win! These sound scrumptious! And so easy. Actually,(as my 4 year old grandson, Max, would say) these sound simple enough for Max and me to make together, though most would probably be eaten before they were completed! Also, I may have the answer to next Christmas' office presents. I can hardly wait to try them. One comment, though. I hope the cook doesn't lose points because of the plate. I was thinking of cinnamon and thought the irregular red shape was a cinnamon brittle until I read the recipe. Probably no one else thinks like I do, but if any judges do, don't let that plate distract you from a yummy recipe! I think that I would like to try this recipe myself although it would be a nice one for Juliette, my grand daughter as well. Right now I think that it would taste very good. These look awesome, and delicious and EASY! Can't wait to try them at home and share this recipe with friends who have children and/or grand-children!